My fiance and I just completed our first cake trial. 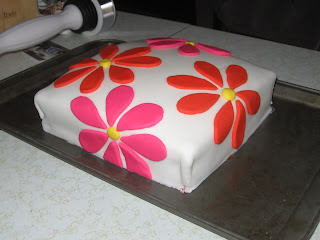 Since we are on a tight budget, we have decided to bake and decorate the cake on our own. We baked it yesterday and let it sit overnight in the freezer to harden some. We didn't buy enough cake mix, so our layer is only half the size it should be, but we know for next time! This was our first time using fondant so that was definitely an experience. 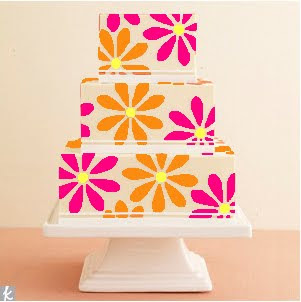 I LOVE to watch cake shows with Amazing Wedding Cakes, The Cake Boss and Ace of Cakes being some of my favorites. So I wasn't completely clueless as to what to do. I definitely need to practice some more though. But anyways, without any further ado, here is our first cake trial...! So not too terrible right? I think we did pretty darn good for our first time! Just a reminder, here is the look we are going for.. I think we are well on our way there! What do you think? Not bad for your first time. Make sure the cake mixes are dense enough to not crumble under more layers. 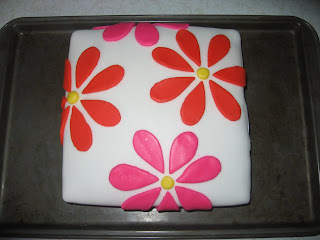 I know a lot of boxed cake mixes are light and fluffy, so they can not hold a layered cake very well. That is an amazing 1st trial cake! WOW! I would have thought you make them often... great job! 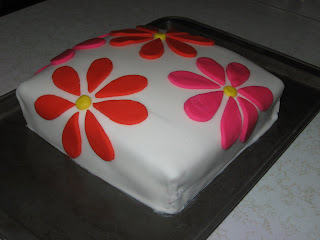 I want to make a damask design on a cake for my daughter's 1st birthday but was so intimidated by the fondont... maybe I will give it a try. wow thats a great job!